By the looks of it Prickles and the van Demons found their first bit of track today and covered about 7 kms without having to fight their way through the bush - although who knows the state of the track/road. They followed the Kelly Basin Road (see on map, along Purgatory Creek marked in blue) for a few miles to the Franklin River Road. 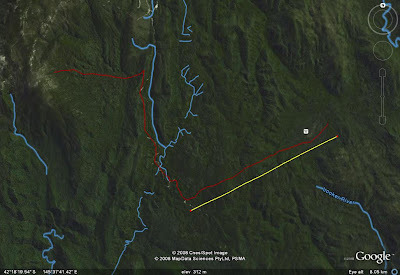 They went down that 'road' for a kilometre or so and hit the Darwin Crater Track (roughly alongside the yellow line) which they walked along for 4 kilometres into the (suspected) crater, and back into the un-chartered scrub. Their rough progress so far today is marked with red and the yellow yard stick is 3.7 kms. The little white square is the middle of the crater.... They might camp on the Andrew River tonight, but can probably smell the Franklin River as well, where they will likely get to tomorrow!